PanARMENIAN.Net - VivaCell-MTS continues supporting students when specializing in the disciplines they have chosen for their future careers. VivaStart educational program, which was launched in 2015, is a good starting point for participants to discover their own potential and to define perspectives of professional development. 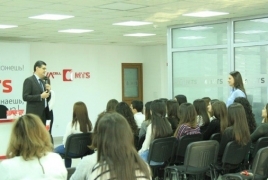 The program gives students from various universities of Armenia opportunity to learn business ethics and to develop practical professional skills in real-time working environment at the Company’s service centers. Besides, the students also learn how to pass job interviews and prepare resumes and CVs. The purpose of this is to help them enter the job market with more professional confidence. At the event organized at the Company’s headquarters VivaCell-MTS General Manager Ralph Yirikian handed certificates to the last group of students of VivaStart 2018. The group included 38 students from various regions and universities. In two-month period the young people mastered efficient communication with subscribers, learned the specifics of the services and offers of the Company, and developed their marketing skills. Three of the best performing students got Samsung J6+ smartphones. VivaStart in 2018 involved 110 students. Ten of them have been accepted to work at various service centers of VivaCell-MTS. “VivaStart is an important starting point to develop professionally in a working environment, to understand the interaction between employers, employees, and third parties, and to master skills in finding agile solutions. I am sure before your participation in the program your understanding and approaches were different from the vision you have about work now. It is crucial that you apply the knowledge you gained, in practice, and that you value the civilized model of communication. Congratulations on your successful completion of the program! I hope you will do the best in whatever you choose to do in future,” VivaCell-MTS General Manager Ralph Yirikian said. The overall number of students involved in the program since 2015 is 294. 43 of the best performing students have joined VivaCell-MTS staff since 2015.